Skip has been involved in water polo as an athlete/coach since 1983. Playing career included Miramonte, Diablo Valley College and UC Berkeley. As the team captain at DVC, Skip earned 2nd team All-American status in 1988 and led the team to the State Championships. Skip has competed in many Master's National Championships. In 1993, he earned MVP honors in the Masters Championships in Arizona. Skip began his coaching career as a recreational swim coach at Moraga Valley Pool from 1984-1988. He was Head Coach of Moraga Ranch Swim Team from 1989-1991. In 1991 and 1994 Skip coached the Miramonte Frosh/Soph team. In 1996, Skip began coaching the Las Lomas Boys' Varsity Water Polo team. Las Lomas captured the DFAL league title in 2000, 2001, 2013, 2015. They were North Coast Section runner-ups in 2001 and 2002. They won NCS DII in 2010 and 2011. His teams have reached the NCS playoffs 21 consecutive seasons and he has amassed 391 wins between 1996 and 2018. In 1999, Skip was named NCS Honor Coach. In 2002, Skip was named as the Contra Costa Times Coach of the Year. In 2012, Skip led 680’s 10U Coed team to a Silver Medal in the Platinum Division at the National Junior Olympics. He has coached all levels of boys' teams at 680 WPA. 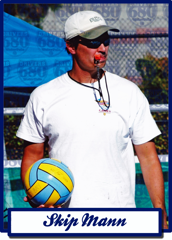 Skip was a co-founder and President of East Bay Water Polo Association in 1997 before the program became 680 Water Polo in 2006 as Skip and Matthew Mundelius merged their respective programs to form 680 WPA.